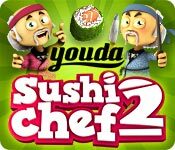 Step into the delicious world of Youda Sushi Chef 2, where you put your culinary skills to use. Prepare dishes in 6 restaurants all over the world. Learn mouth-watering recipes from the local cuisines by heart. Serve a вЂ?Diner DelightвЂ™, the вЂ?Venice pieвЂ™ and a spicy вЂ?Tortilla poncho'. DonвЂ™t forget to keep an eye on your supplies and order fresh ingredients on time. Manage your restaurant like a pro. Upgrade your kitchen to speed up preparation time, get a faster conveyor belt and perform better tricks. Purchase a better coffee machine and upgrade your telephone to order multiple fresh ingredients at once! Get вЂњStar powerвЂќ to create irresistible puddings, instantly re-fill your ingredient stack, do magic tricks or just freeze all customers to buy some time; anything is possible! Earn enough stars to progress to the next level! Prove that you are the best chef and beat your boss in each restaurantвЂ™s final Battle.